Numbering more than 212,000 throughout the nation and the world, alumni of the Johns Hopkins University are leaders in private, public, civic, and community initiatives. Highly skilled in multiple disciplines, Carey alumni, more than 25,000 strong, are recruited internationally by corporations, nonprofits, government agencies, and health care systems, and advance quickly to senior leadership positions. Our students differentiate themselves by the networks they build, the skills they acquire, and their unique ability to excel in their fields. Throughout their time at the Johns Hopkins Carey Business School, students go through a continuous assessment of their career skills and knowledge. Highly skilled, and motivated graduates. In addition to their extensive knowledge of business theory and practice, students graduate with practical skills that are immediately valuable in their current jobs and remain relevant throughout their careers. They are individuals of diverse backgrounds, nationalities, and experiences who want to have a transformative influence on those around them. Students at the Johns Hopkins Carey Business School are innovators, entrepreneurs, and creative problem solvers; people with stellar academic records; optimists eager to foster an era of productivity, transparency, and ethical behavior in all business. A leading-edge business school situated within one of the great research universities in the world. Collaboration and interdisciplinary program offerings with internationally-renowned Johns Hopkins divisions, including the schools of medicine, nursing, public health, engineering, and arts and sciences. An innovative business school curriculum, based on the Johns Hopkins model of combining theory and practice, taught by a faculty comprised of Johns Hopkins professors and prominent business leaders. 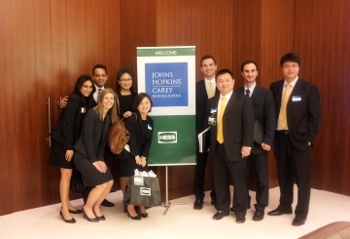 A worldwide alumni community that includes more than 25,000 Carey Business School alumni who are part of the Johns Hopkins alumni community. More information on our students and alumni can be found here.